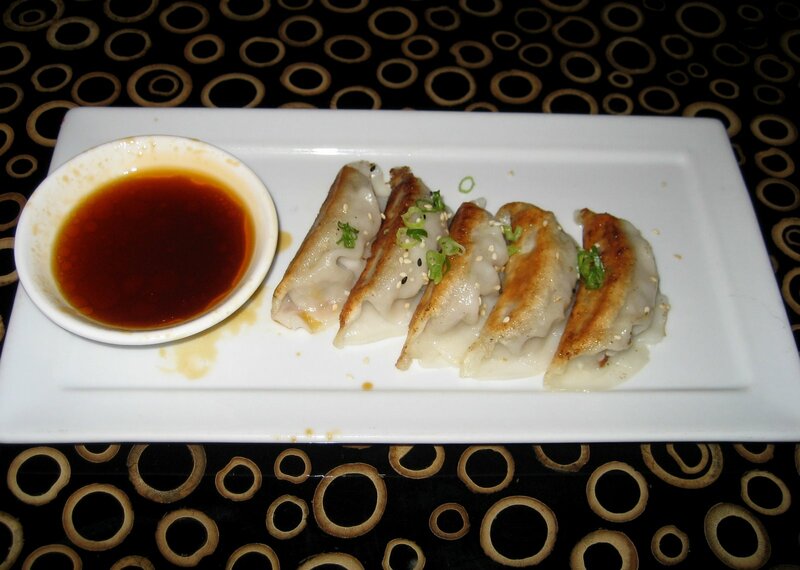 Pan-fried pork dumplings topped with green onions and sesame seeds. This gyoza was deliciously fried and filled with goodness, and did not even need to be dipped in the sauce. It was cooked very well (soft, not chewy) and had an excellent flavor. For the most part gyoza is consistent across restaurants and these definitely rank in the top-tier. Grilled, marinated chicken in teriyaki sauce. 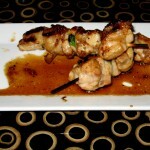 An order includes two generous skewers of mouthwatering chicken. 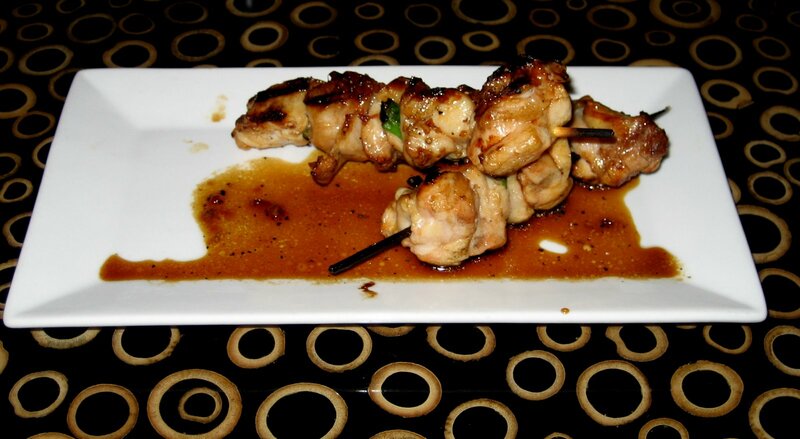 This is by far the best yakitori we have ever had. It tasted like the chicken was barbecued given its slightly charred exterior. It was extremely flavorful and again, the sauce was not necessary. Some parts were a little fatty/chewy, but it did not detract from the overall quality. 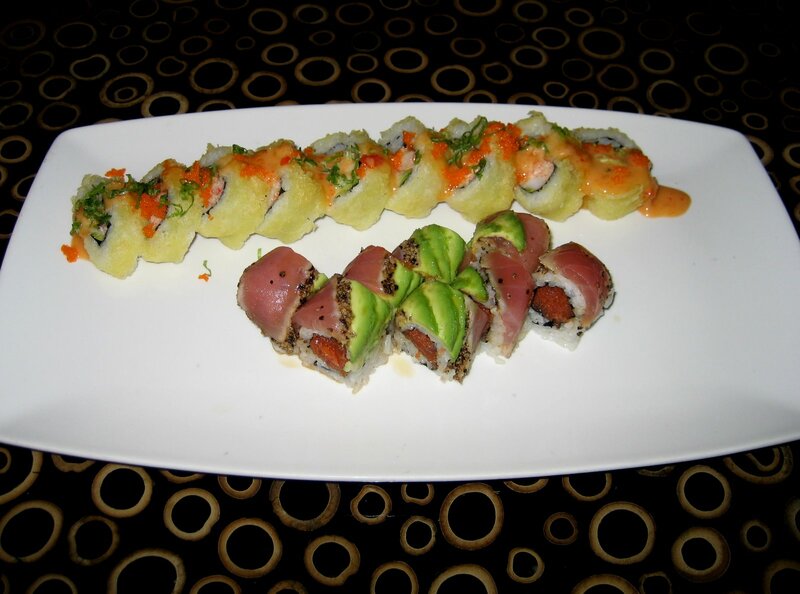 Our advice is to not limit yourself to just rolls, and order a few of these. Spicy snowcrab, shrimp, avocado, tempura fried, Kenobi sweet & sour sauce, masago, green onions. This was our number one choice when ordering given the exciting description. However, this roll did not live up to our expectations. Even though there were two types of fish in there, we could not taste either. The only thing we tasted was the airy, tempura fried exterior with their sauce. As you can see from the picture, the piece on the end was covered in sauce, but the other ones barely had any. 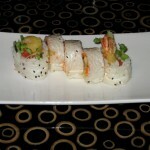 If you are looking for a warm, fun, fried roll with lots of sweet and spicy sauce, try the Phoenix Roll at Midori. Spicy tuna, peppercorn seared tuna, avocado, ponzu, sesame oil. 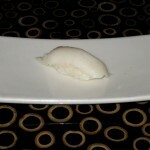 This sounds like a simple roll, but it was actually our favorite. The tuna was fresh and flavorful and we really enjoyed the seared tuna on top. However, other than the tuna we did not taste the other ingredients, such as the avocado or ponzu. Also the the roll was a bit on the small-side. Even so, this roll is a good choice especially during happy hour. Shrimp tempura, spicy tuna and sprouts, with soy paper on the outside. This roll was not on the menu but our waiter said it was a popular one. 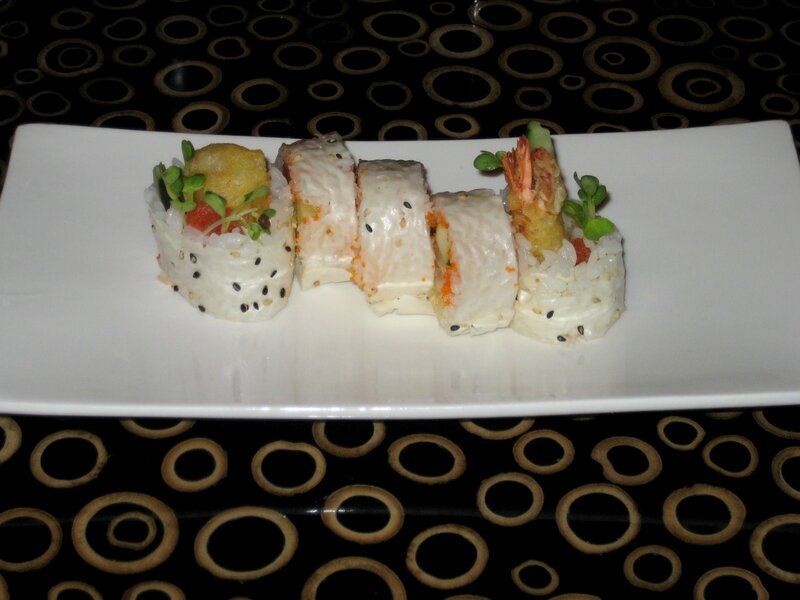 Because of the soy paper, we could taste the spicy tuna nicely, and the shrimp tempura added a nice crunchy texture. It wasn’t very very flavorful, but it was still a decent roll. 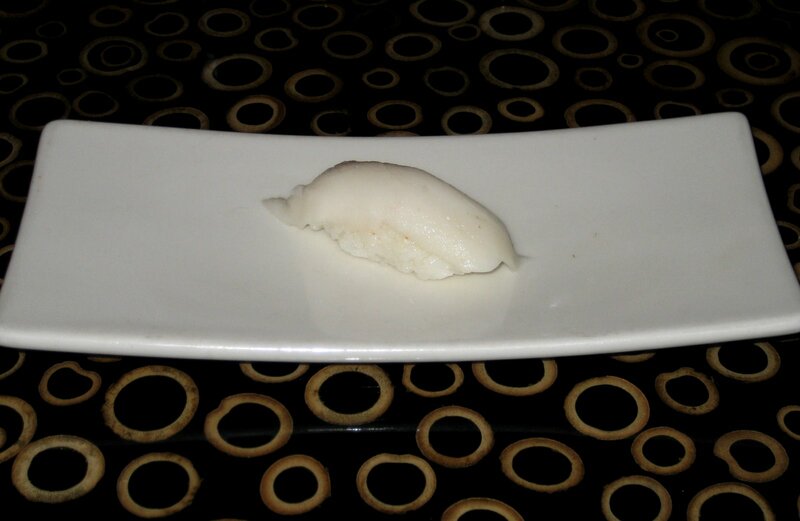 Escolar is our favorite fish so we decided to give it a try here. We wish we didn’t though! We were getting ready to dig in but we noticed an odd “fishy” smell emanating from the escolar. It reminded us of the smell of fish at Kona Grill which gave us food poisoning in the past. Naturally, we informed the waiter of the smell and he took it back. We dined at Kenobi during their Monday Madness happy hour that takes place every Monday from 4pm til close. The cool thing about this happy hour is that you can sit anywhere in restaurant to take advantage of this. You don’t have to worry about fighting over a couple of bar-area tables to get the discount. What was even more impressive, we were allowed to make reservations in advance for happy hour! When we arrived at the restaurant, we were taken directly to our booth that we had reserved. Our waiter was friendly and patiently answered all our questions regarding the menu. He did periodically check up on us, but our waters were never refilled. One surprising thing that happened is that when we got our sushi, we did not get a soy-sauce saucer, ginger, or wasabi. Quite strange given that this is a sushi restaurant. As we mentioned earlier, we had to send back the Escolar and it was removed from the bill without any fuss. Overall the service was solid, but there is some room for improvement. 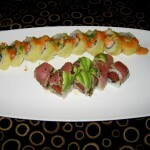 Kenobi is a large, trendy sushi restaurant located in the Arboretum. This is the type of place that looks like it belongs in Los Angeles or Miami, but without the pretentiousness. It is upscale, hip, and elegant. There are several rooms and bar areas with dark wood and earthy tones. The many seating choices include: cozy white couches, comfortable booths, the modern and well-lit bar area, and regular tables. There are two seating areas which have accent walls covered with mosaics of small stones, bamboo chairs, hand-painted tables and uniquely modern light fixtures that resemble giant garlic bulbs. When the weather permits, sit outside in their lovely garden-style patio. Kenobi would be great for an intimate dinner or for large groups. They also boast an impressive bar selection with lots of sake options, martinis and a large wine list. We’ll come back to try some of their non-sushi entrees because we hear through the foodie grapevine that they’re innovative and tasty.